In 1959, Nikon debuted its first flagship SLR camera, the Nikon F, and changed the face of photography forever. It offered unprecedented performance and reliability, and it helped photographers capture some of the most powerful, enduring images ever shared with the world. Celebrate Nikon's 100th Anniversary with this painstakingly recreated model of the legendary camera. Its die-cast metal construction is faithful to the original Nikon F, including the attached NIKKOR-S Auto 50mm f/1.4 lens and even some moveable parts. Its packaging is based on the original Nikon F packaging, and it includes a replica of the original user manual cover and a black resin display plate with a clear acrylic cover, making it a gift sure to delight the photographer in your life. In 1959, Nikon debuted its first flagship SLR camera, the Nikon F, and changed the face of photography forever. Celebrate Nikon's 100th Anniversary with this painstakingly recreated replica of the legendary camera. Its die-cast metal construction is faithful to the original, including the attached NIKKOR-S Auto 50mm f/1.4 lens and even some moveable parts. 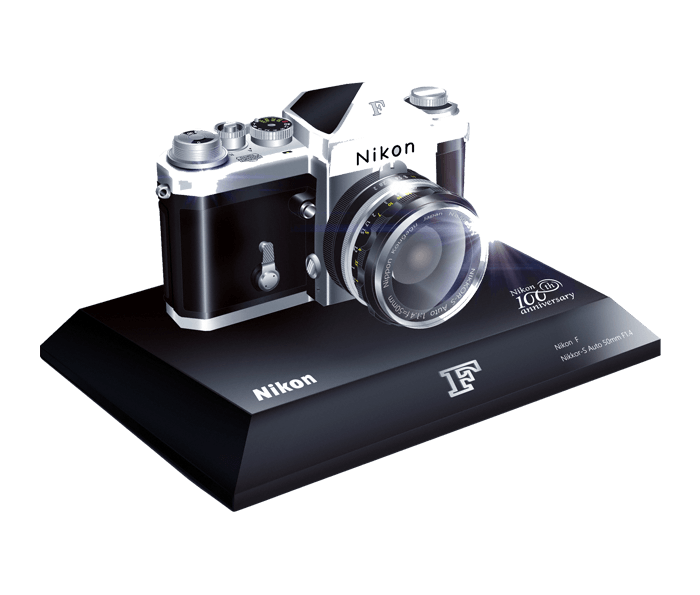 Its packaging is based on the original Nikon F packaging, and it includes a black resin display plate with a clear acrylic cover.